Cool off in the water before resuming your post in that perfectly-angled lounger. Go ahead, sip that cocktail and mentally pat yourself on the back for a resort well chosen. There's an onsite gym for the fitness-faithful. The game lounge makes it all feel very official, like you should be earning grandmaster points or something. Ask about the onsite "Play Days" activities program for kids. They'll make some new "vacation friends" and return to you smiling and tired. The Pompano Beach Golf Shop and Course is an easy 8 minute drive away, and the perfect place for newbies and pros alike to spend a beautiful sunny day. Luckily every suite has a private balcony, so you can enjoy a cool ocean breeze any time you like. After all, don't nightcaps taste better outdoors? You're just a 20 minute drive to the "Rodeo Drive of Ft Lauderdale." Las Olas has the best shopping, plus numerous art galleries and upscale eateries. A 16 minute drive away, stroll through the historic home's beautiful grounds on a sunny day. Or tour the interior to admire antique art and décor. Set up camp at this beach park for the day, the kids can run around the playground while you barbecue up some grub. It's just a 20 minute drive away. Don’t be misled by the west coast-sounding name, the Wyndham Santa Barbara is as east coast as it gets, perched on the shores of the south Florida Intracoastal Waterway. This 10-story Gold Coast waterfront retreat is conveniently situated next to the bustling marina and home to the popular and aptly named Serenity Yacht Cruises. (Head out at sunset and you’ll wholeheartedly agree on the choice of names.) 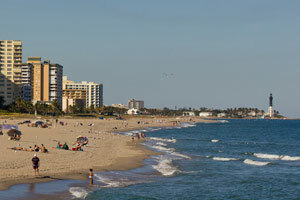 Guests have private access to Pompano Beach, an easily flip-floppable ten-minute walk-slash-stroller-push. Pack your beach bag full of the fin-and-snorkel-mask essentials, toss in some sunscreen, a sand pail and snacks, and head across the street. If you want to stay closer to home for kid-nap purposes, the outdoor pool and hot tub are steps from your door. The Play Days activities program is an excellent strategy for wearing out even the most active little ones. And for the times you’re on your own, divide and conquer on pool patrol duties, with one adult staying while the other hits the fitness center. Keep dinner low key with those family favorites you can practically make in your sleep – or appoint a grill-master and plan a cookout on the patio BBQs. Even though you’ll want to spend as much of your time as possible out in the warm Florida sunshine, the studio, one- and two-bedroom suites give you plenty of living space inside. Ranging in size from 500 to 1,200 square feet, they’re each equipped with well-appointed kitchens, and TVs with DVD players and gaming systems to keep the kids entertained while you see if you’ve got what you need on hand to make dinner. Not feeling up for cooking? Fake a missing ingredient scenario and head for a local favorite like Bangin’ Banjo or the tiny, always packed, and slightly hard-to-find Fish Shack. If you’re back before sunset, step out on your private balcony for one last look at the marina views before heading in for a rowdy game of Super Big Boggle or Outburst. The Ocean Boulevard address puts you close to the up-and-coming Pompano Beach scene, so dining options abound. Plus, you’ll get discounted greens fees for the three courses at the nearby Palm Aire Country Club. The Oaks and Cypress courses were designed by Tom and George Fazio, while the Palms was expertly laid out by William Mitchell. The club has a star-studded history dating back to 1959, when big names like Frank Sinatra, Elizabeth Taylor and Jerry Lewis stayed there. Once upon a time, the tennis pro was Billy Jean King, and even the New York Yankees would stay at Palm Aire during spring training back in the day. Wyndham Santa Barbara guest discounts apply to the 6,000 square foot Soleil Spa Palm Aire as well. Spend the day indulging in skin and body treatments, or just take advantage of the comprehensive fitness center, saunas and steam rooms. Still going strong? Check out the nearby Butterfly World, and cap off your stay with a sunset dinner cruise on the resort’s luxury yacht, Serenity. - The front desk is open 7:00 AM - 11:00 PM daily. Guests that are planning to arrive after 11:00 PM can check in with the security located in the lobby. For more details please contact the property using the information on the booking confirmation.